Fall protection surfaces made of artificial grass or rubber, so-called rubber asphalt, are surfaces that have become increasingly more popular instead of using sand. By installing artificial grass or fall protection rubber you get a surface that makes the area available for everyone, whether you have a stroller, wheelchair or other means of transport that otherwise would have problems running in sand. 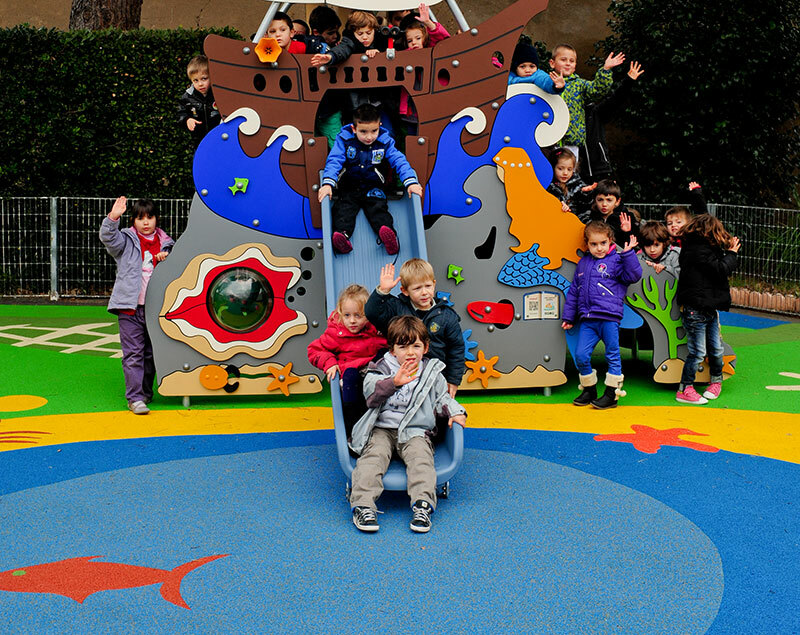 In addition to good accessibility, both rubber and artificial grass are solutions which give the playground, th outdoor gym or the activity area a soft and comfortable surface. They both also have excellent water drainage properties. In cold weather conditions, fall protection rubber and artificial grass don't get affected by the weather the same way as the sand does by frost. Both rubber and artificial grass retain their softness all year round. Installing artificial grass or fall protection rubber can make the initial outlay on building costs higher than installing a sand surface. On the other hand, the operating cost for sand over a 4-year period is significantly higher than for artificial grass and rubber. Each item of playground equipment or exercise equipment has a specific ’critical fall height’ and requires an appropriate thickness of fall surface. We will help you to find the right solution based on your needs and circumstances. Artificial grass and rubber surfaces in many different colours, allows your imagination to create great color combinations and to make mounds and patterns. Through creative expression, we build attractive spaces that inspire children and young people to play and movement. For children, play and learning go hand in hand. Children relate to the world through play. Great playgrounds are fantasctic places for children's physical, social and cognitive development. With artificial grass and rubber surfaces, you also get the opportunity to enhance children's learning through imaginative designs. With extensive experience and a wide assortment of different fall protection systems, we will help you to find the best solution based on your needs. Contact us for advice, design sketches, cost proposals or other questions regarding your upcoming project. We will help you to create playgrounds and activity areas of the future that are available for everyone.